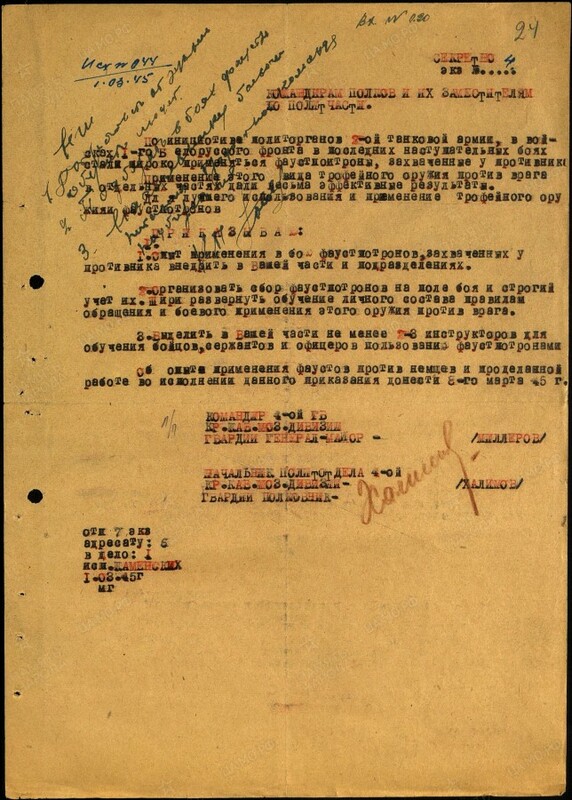 On the initiative of the political department of the 2nd Tank Army, captured Panzerfausts have been widely used in the forces of the 1st Belorussian Front. The use of this weapon against the enemy led to very effective results on several occasions. Spread experience of using Panzerfausts captured from the enemy in battle among your unit or formation. Organize the collection of Panzerfausts on the battlefield and precisely maintain their inventory. Organize training of personnel in using this weapon against the enemy. Dedicate at least 2-3 instructors in your unit to train soldiers, sergeants, and officers on how to use Panzerfausts. Report on your experience in using the Panzerfaust against Germans and the completed work in carrying out this order by March 8th, 1945. 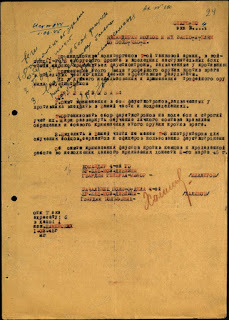 4th Guards Tank Division Political Department Chief, Guards Lieutenant Colonel Halimov."